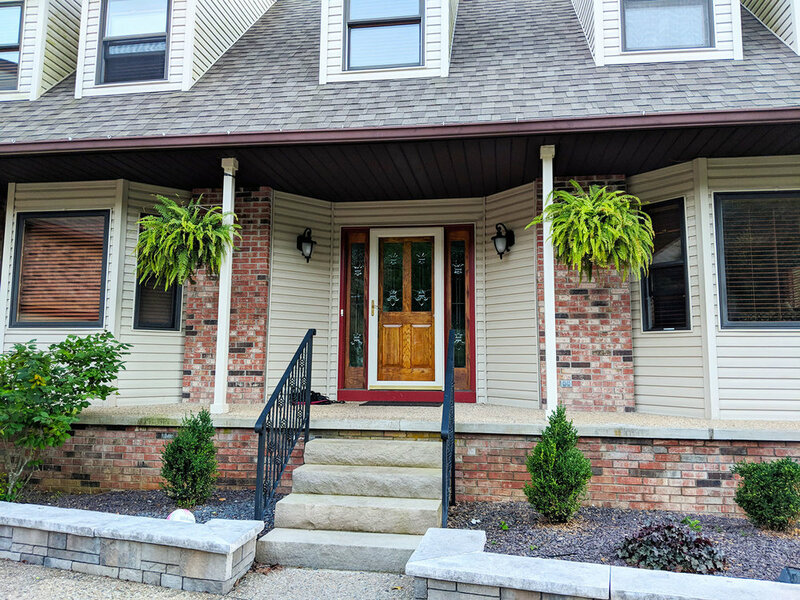 No doubt you’ve seen photos of lavish, over the top porch designs. Not only do the designs appear complicated and hard to replicate, but they can also be terribly expensive. 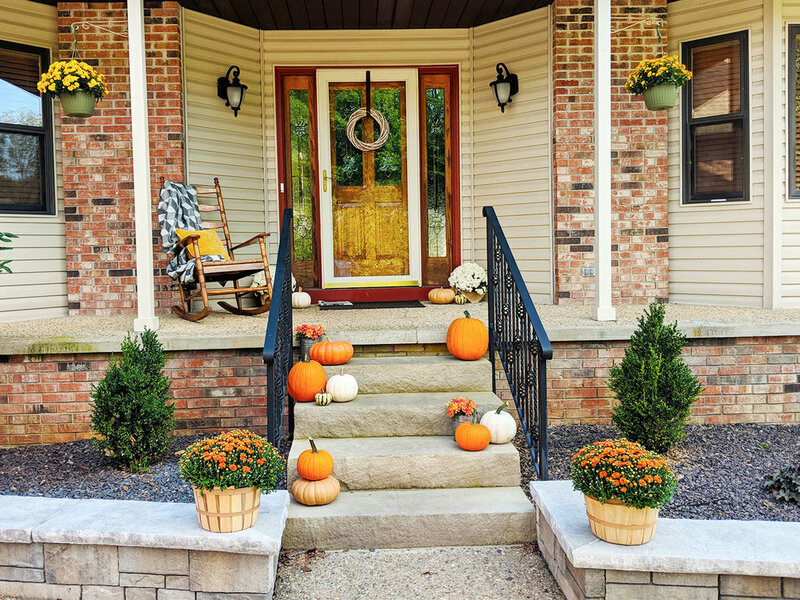 Well, I’m here to tell you a beautiful fall front porch doesn’t need to break the bank or take up a whole weekend. With a few props from around the house and a single stop to my favorite local nursery, I was able to pull this design together for about the price of a dinner out. When doing a porch design, consider the area you have to work with. The amount of decor you introduce to the area must be in proportion to the amount of space you have to work with. Don’t cram pumpkins into every space you have, instead cluster them and leave other spaces open. This will create a casual and welcoming space. Once you have a good handle on how much space you have to work with, think about the design itself. Do you want something fun and festive, or elegant? I chose a clean and simple esthetic. Whenever decorating a room, I always consider the elements I already own. In this case, I started with a basic understated wreath and a rocking chair. 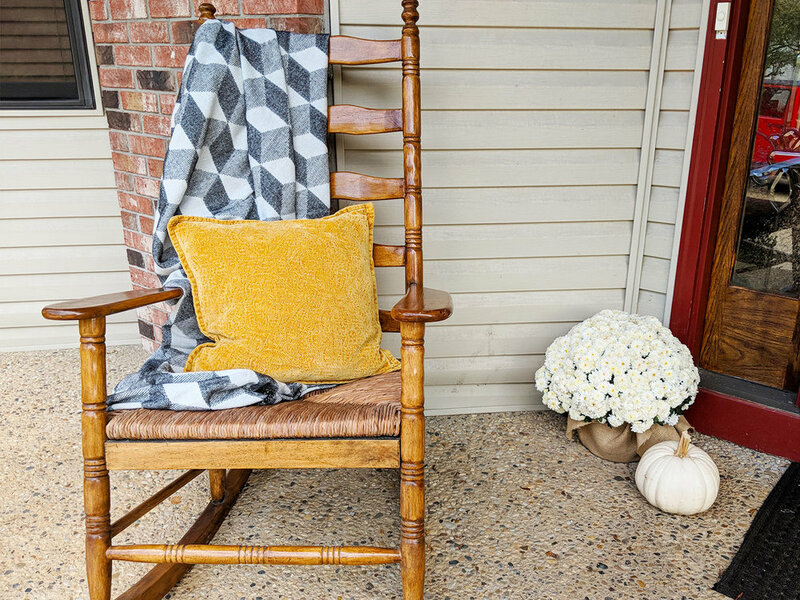 From there I wanted to add some warmth by placing a throw and a pillow on the rocking chair. Digging though my assets, I felt my black and white flannel blanket and goldenrod pillow would work great with my color scheme. Looking at the colors within the items I already owned I knew I wanted to work with browns, oranges, golds and whites. Certainly, this is typical for autumn, but don’t be bashful, you could just as easily do blues or purples. 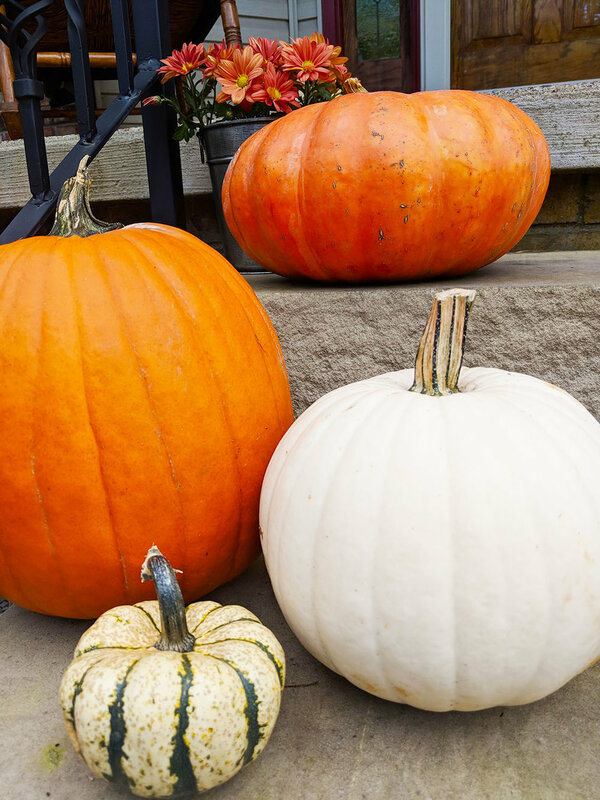 When shopping for your fresh pumpkins choose as many different colors and sizes as you can while keeping with your color scheme. Using all the same size and color will not lend itself to a very appealing display. I loved the way the light orange and white pumpkins worked with my color scheme, so I made sure to get quite a few of those. 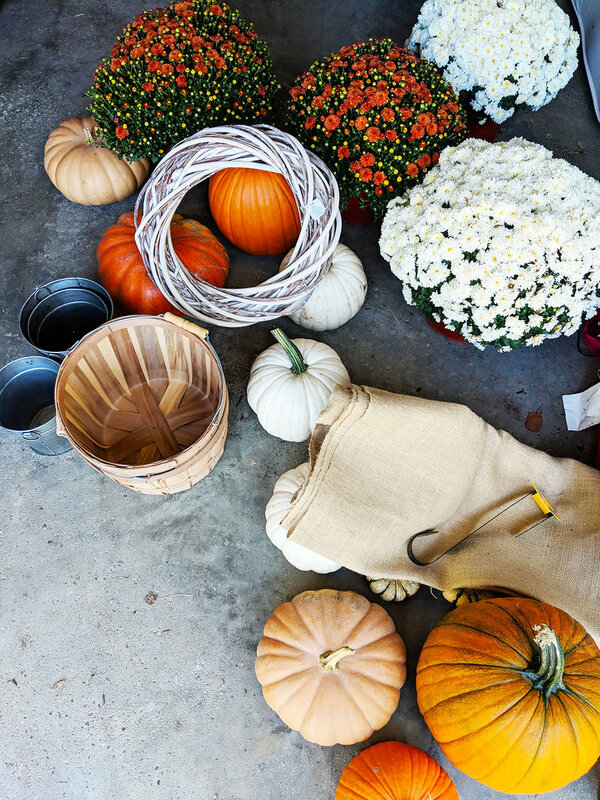 Remember that you will be clustering your pumpkins so very small pumpkins or gourds can really add dimension. The mums I decided on were white, bronze and gold, but I used different containers to vary the texture. For my white mums I wrapped them in burlap. I used metal containers for the smaller 6-inch bronze mums and wooden baskets for the larger mums anchoring the display. Having everything at the same level will read as uninteresting. 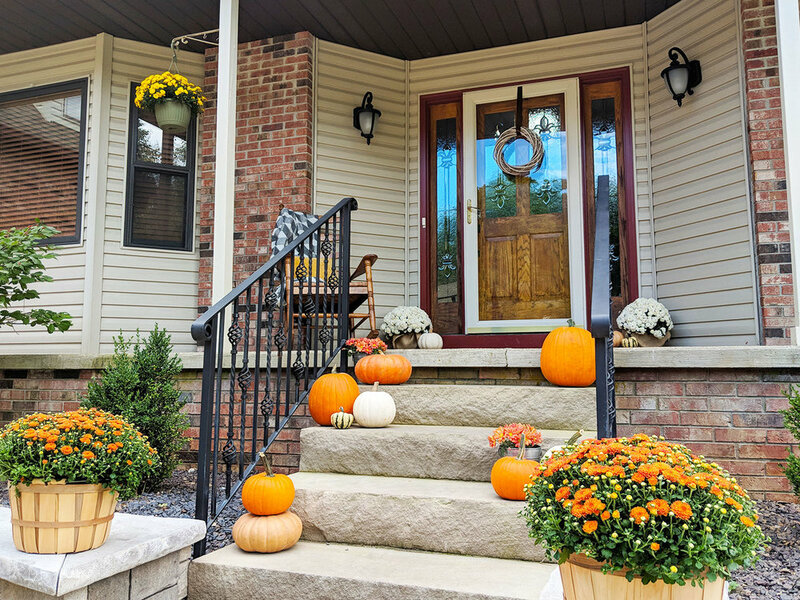 Place pieces high, like the door wreath, mid-range, like the rocking chair, and low, like the lower stair pumpkins to make it the most appealing. It never hurts to have a photo for inspiration, but don’t be scared to make it your own. Most of all, have fun! This story first appeared in the Herald Times on September 29, 2018.